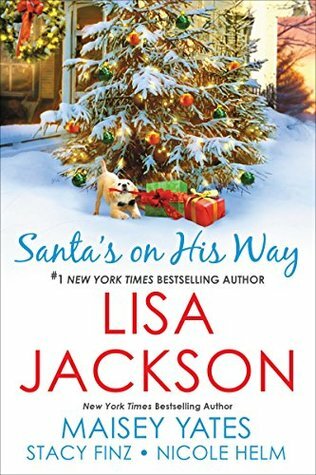 Santa on His Way is a heartfelt collection of four romantic stories. Christmas has that magical feeling…and these characters have captured my heart. In one story, I found a young, brave, yet broken hearted woman. Her one love, aka boyfriend, has let her down for the last time. She immediately goes to her best friend, Noah. Noah has loved Meg since he was seventeen. Nothing has ever stopped his feelings for her. He pushed them aside every time, because Meg was so wrapped up in the other guy. But now, they have a chance at forever. But will the always there Noah be brave enough to accept Meg as his? The next story, presented me with two rivals. Each one wanting the old saw mill for a restaurant of sorts. One currently owns the town’s brewery and the other is the town’s baker. Then, they get stuck at a wedding reception during a snowstorm. The cold has a way of bringing out the truth and romance. Can either one settle aside their anger and accept a partnership in both love and business? The third tale, was about the youngest sibling of a cowboy family wanting to leave her ever demanding family. Lindsey wanted to find herself. But she never once thought how her leaving town affected the one man she loved and left behind. All those years, and Cal still loved her. His anger makes it hard for either one to move forward. But Lindsey isn’t backing down now. Love is worth fighting for…but only if Cal lets her back inside his heart. The last story, is a about a woman whose husband divorced her. She went through a lot of miscarriages. It’s Christmas time, and Annie is feeling lonely with her dog. Until a noise brings her to her door where she finds a baby left behind. Puzzled, she finds a note addressed to her. The baby belonged to her sister who, couldn’t raise it. And the father didn’t want it. Then, there’s the other man who comes barging onto her doorstep. Liam thinks the baby is his. Nola set him for for murder and then recanted it. But he’s still a suspect to the police. Only Nola knows the absolute truth of the crimes committed. But it will take everything to trace her down and ask the questions. Liam won’t leave without the newborn baby. However, Annie isn’t sure it’s his and won’t let him take the baby away. Both want the baby. Christmas around the corner, a snowstorm, and a baby in the cabin leave for funny ideas. Romance, marriage, and creating a family…but can the characters find the truth and happiness before they lose everything that matters? Overall, Santa’s on His Way is an amazing collection. I loved each of these romantic stories. Forgiveness, family, and finding love…are major themes. I highly recommend this contemporary set to all readers.